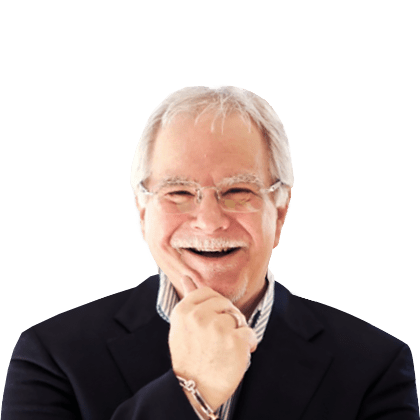 I’d like to share with you some of my thoughts on risk, and how it relates to your investment success because I believe that what most of us have been taught about risk is wrong. 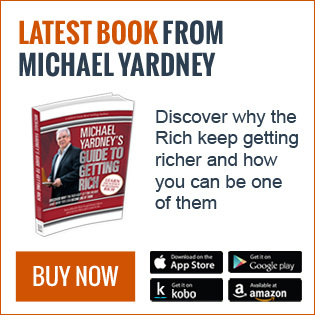 In fact it’s probably holding you back from obtaining real wealth. If you are like most investors somewhere along the line you’ve probably heard that there is a continuum of risk associated with different investment vehicles, with low risk investments at one end and highly speculative ventures at the other. Most believe that any investment can be placed somewhere along this continuum, and that in general, the higher the risk the greater the reward. Somewhere along this spectrum sits property. 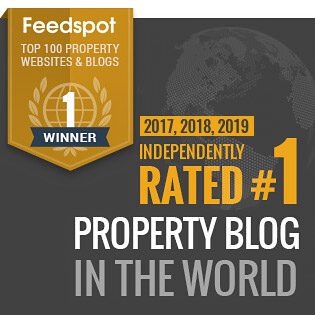 Within the property sector, houses are considered “safer” than vacant land, while commercial and industrial real estate is considered riskier, as values can fluctuate more. Then there’s “common wisdom”, which suggests that properties in capital cities are less dicey than in regional areas. The innate problem with this approach is that while we are taught to evaluate the level of risk in the investment itself, as well as general market risk, there is a critical factor missing – you the investor. Imagine you are considering undertaking a small residential property development. In isolation, this question is impossible to answer because we don’t know enough about you. Essentially, it’s impossible to distinguish discussions about risk from an assessment of the investor. You could turn to a trusted advisor to help make up for your lack of knowledge, but the only way to unfailingly lower your own investment risk is to become an expert in a particular area. How do you know you’re an expert? You have to consistently outperform the market in the given investment niche over time – preferably a couple of investment cycles. An element of risk is inherent in any investment, but the truth is that you the investor, are the biggest risk variable of all. 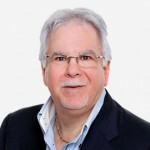 The difference is generally in the individual’s skills, contacts and expertise. 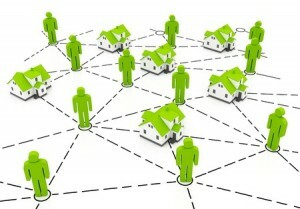 Over the years I’ve seen people make a lot of money out of real estate, but I’ve seen just as many people lose money. Sophisticated investors manage to obtain higher returns without taking a higher degree of risk, which is the exact opposite to what conventional wisdom tells us. Your experience and network of contacts can be your biggest competitive advantage or your most potent risk factor. 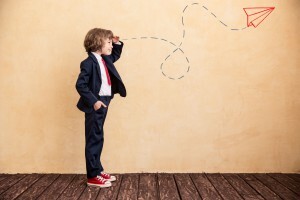 Investing in your specialty area allows you to achieve a higher return because, as an expert, you will be able to find opportunities the average person can’t. 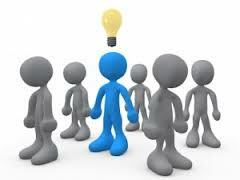 What contacts do you have who can help you make an informed decision or let you know about an opportunity before others? 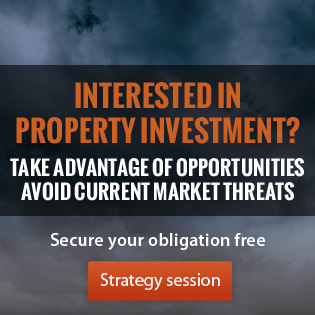 What do you know about an investment opportunity that others don’t, about timing in the property cycle, or a change in government legislation? For instance a visit to the local council might uncover plans to re-zone a particular area, allowing multiple units on a site where before you could only build one dwelling. This in turn can make the property more valuable and the investment less risky. Real estate is what I call an imperfect market. 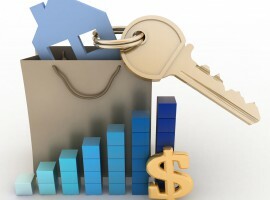 If real estate was a perfect, liquid marketplace, you wouldn’t be able to buy property considerably below value. Information, contacts and expertise help you in an imperfect market – they make the investment less risky. 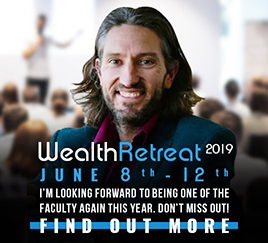 By the way…you could increase your expertise by gaining specialised knowledge at Wealth Retreat 2018 on The Gold Coast in early June. The more control you have over your investment, the lower your risk. When you buy shares you have no real control over their destiny. 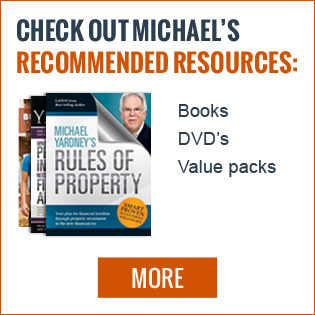 That’s one of the reasons I love real estate – I have control over my property. 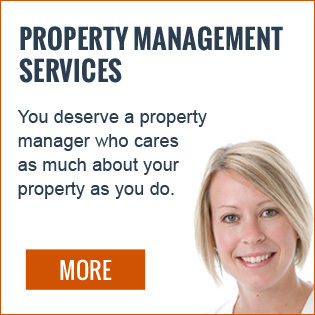 I can add value through renovations or redevelopment, change property managers if I am unhappy with their service, or furnish the apartment if it’s appropriate. 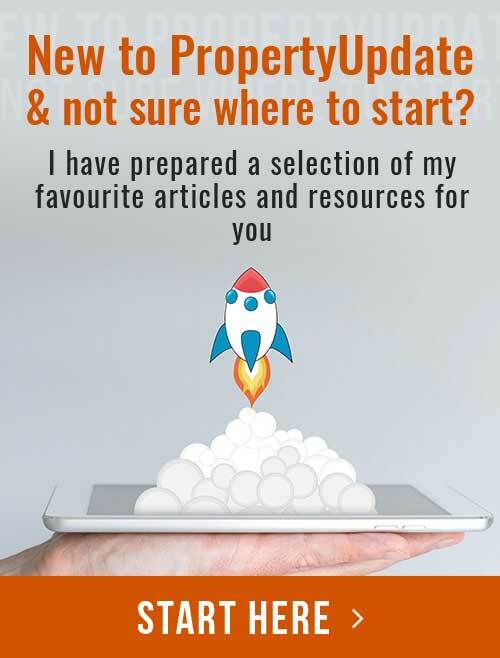 Is all the information about your investment disclosed? The more you know, the lower the risk. When you invest in shares or property trusts, you have partial disclosure. There are guidelines as to how publicly traded companies should report to their investors, but if these worked well, there wouldn’t be as many stock collapses as have occurred over the years. Liquidity means the ease with which you can recover your money by selling the investment and converting it (or part of it) to cash. 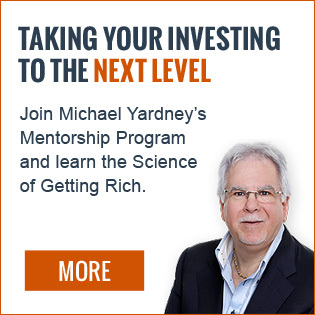 The greater the degree of liquidity, the lower your risk. Real estate is not as liquid as shares or trusts, because even though you can sell your property it takes more effort and time. Smart investors never sell properties to release cash – they refinance and draw down on unused equity. Your own liquidity is another major risk factor. 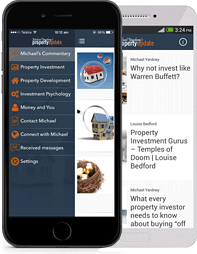 Property investors buy the necessary time to see them through a property cycle. The more buffer you have, either as a line of credit or cash reserves, the easier it is to weather a storm. Without a sufficient buffer, especially in more turbulent times, you’re at risk from things such as interest rate hikes, extended vacancy periods, etc. The more secure the returns, the less risky the investment will be. 6. 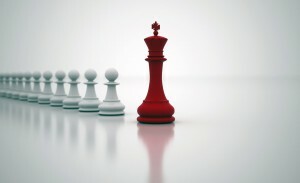 Is Your Principal at Risk? 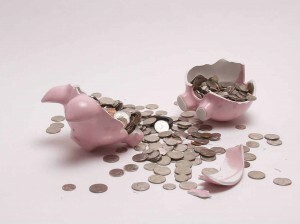 Is your financial outlay secure if the investment fails? An initial cash investment (your principal) in a bank term deposit is considered very secure, whereas if you buy shares it’s possible for the company to fail and the shares to be worthless. With property you generally have to put down a 20% deposit, so if it drops in value by more than 20% your equity (deposit) would be wiped out. The overall median house price in Australia has never fallen more than 5% in one year, even through wars and depressions. But I have come across many investors who have had their equity wiped out. Some highly geared and bought at the top of the market then values fell, while others paid too much buying off the plan and on completion, the value of the property was less than what they paid. Occasionally the value of individual homes has fallen over 20%, especially in outer, interest rate affected suburbs or regional areas. The more secure your principal, the less risky the investment. 7. Are you Personally Liable? When you make an investment, do you have to provide a personal guarantee? This gives others (usually the banks) the right to pursue you if things go wrong. If your liability extends beyond the asset itself, such as when you are personally guaranteeing the loan for a property bought in a company or trust, your personal assets could be at risk. In this instance, if things go belly up and the bank sells your property and can’t recover all it’s debts, they’ll chase you for the difference. 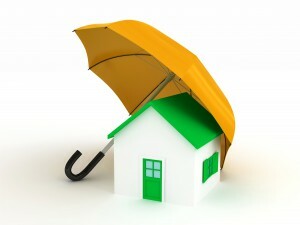 Often the bank requires you to take out mortgage insurance for such an eventuality, but this protects them, not you. The mortgage insurer pays the banks, then chases you to pay them back, with interest! Obviously, the more you are personally liable, the higher the risk to the investment. 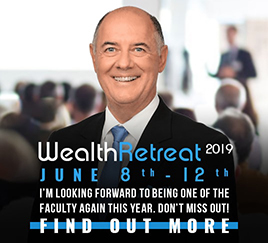 When you join us at Wealth Retreat 2018 you’ll be taught about the best ownership structures by appropriately qualified accountants – click here and get more details. Some risks are inherent to certain markets. For example, if you invest in tourism you are subject to your investment market collapsing if there is a natural disaster, war or disease; Bali’s economy almost crumbled a number of years ago after the bombings and the Asian Bird Flu crises. And I don’t have to tell you what happened to those who invested in mining towns do I? When weighing up risk, consider what impact general economic changes to that marketplace could have on your investment. This is the risk specific to the particular investment. Is it the right property, in the right suburb, at the right price and at the right time in the cycle? When assessing risk, most investors only look at the last two factors – the market and specific investment risk. They rarely focus on the other factors, which in many ways are more significant. You will have your own risk spectrum. Whenever considering an investment, don’t look at the investment alone – look at yourself too. What type of investment choices are low risk, medium risk and high risk for you? And remember, you can change your risk spectrum by developing expertise, to make wealth creation a long term, low risk and high return investment. 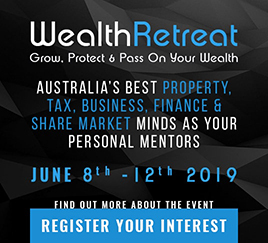 On June 9th to June 13th a small group of already successful property investors, business people and entrepreneurs will be getting together on the Gold Coast at Australia’s ultimate learning and networking event for investors, business people and entrepreneurs. The small group environment will ensure they have full access to Australia’s faculty of property, tax, finance, business and superannuation experts to help answer their own personal situations. This event has been transformational for many of the attendees in previous years. Some have left their jobs to go into property full time. Others found their purpose and left the workforce all together. Yet others continued doing what they enjoyed doing but found renewed passion. Wealth Retreat is full of what I call “ah hah” moments. Transformational moments where things you may have known at a particular level suddenly made sense. 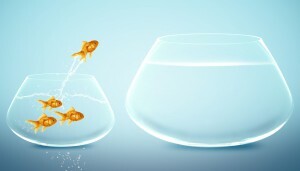 Don’t count yourself out – chat with us to see if we believe you will benefit. And I’ll take the risk – your attendance will be back by my personal guarantee. While the numbers are limited (on purpose) I urge you to call Jo Fitt on 03 9591 8888 and find out more and see if you qualify to join us on the Gold Coast in early June. Or email her at [email protected] to get the process started. We have a limited number of spaces for the event (we’ve always restricted the numbers) and with a large number of spots always taken by repeat attendees it’s going to get harder and harder to get in later. 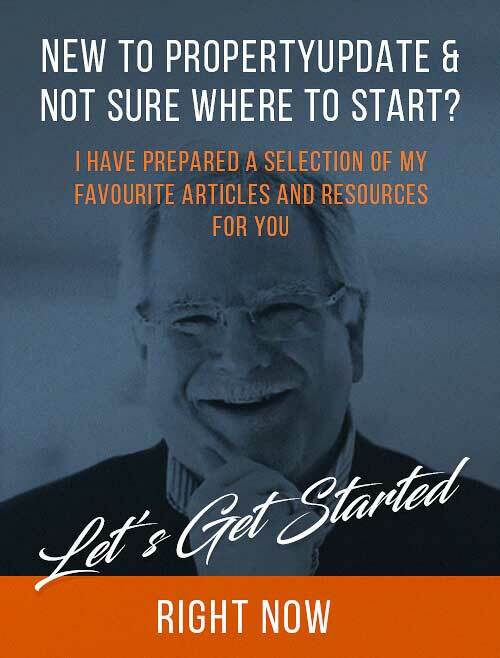 Thanks Michael for the terrific article on the types of risks to be managed (identified and sensible contingencies put in place) by the property investor, including the risk of the investor themselves! The personal experiences offered in two reader comments above only serve to illustrate your point finely, if rather tragically in one case. If only more investors, experienced or not, would take on board your *freely offered* expert advice in your articles over the past decade or two, regarding the risks of not getting financially educated first, of buying off the plan, of buying new high rise apartments or in regional towns, of not budgetting to maintain a good cash buffer, etc. As a Very Experienced Property Investor who has owned 25 properties in my lifetime I totally Disagree with your views on Risk. I’m 57 yo and bought my First block of land aged 18. I’ve bben the ‘Risk Taker’. Currently my finances couldn’t be in a Worse MESS. Most financial advisors have told me to go Bankrupt as I did 20 years earlier. I haven’t this time because 1/ At 57 I’m Never going to recover from this, currently I’m Clinging on to 2 properties as I know if I let them go I’ll Never own a property again with my current Credit Rating, after having ‘3’ properties Foreclosed last year. I’ve been the Risk Taker, my friends the same age have been Very Conservative about their Investments. They all currently own Outright 5 properties each making them worth about $3M Each. I’ve attended Many Seminars that cost a lot of money to attend. The Self Development ones I call SCAMS because having had over 30 years of experience this them my life experience has Proved that everything they say is BS and as a result I run a Campaign to EXPOSE S.D. for the BS it IS. I did 3 dual occupancies with business partners that went Badly. I thought I would be ‘Open Minded’ to different investment strategies so when a salesman sold me an apartment ‘Off the Plan’ on the basis that there would be little or NO negative gearing I bought one. It wasn’t Bad it was a CATASTROPHE, as nearly All OfP’s are. I call them off the plan SCAMS because only the Developers and Salesmen make money, the Investors LOSE money. The last 10 years have been catastrophic for a lot of property investors, rents virtually Haven’t gone up in that time while if you bought in QLD. Council Rates and Water rates have gone up Expenentially. Cairns had the Massive Insurance SCAM where premiums grew by 800% in 5 years causing property values there to Drop by 50% meanwhile rents Didn’t go up. Thanks for your comment and I’m sorry to hear of your predicament. 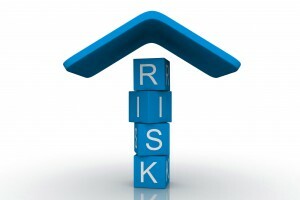 Good article about the importance of understanding your risk tolerance. I don’t see property development as being inherently risky mainly because I have experience doing it and have been mentored along the way, however I wouldn’t advise anyone to just jump in and do it, as you can lose money quickly and easily if you get it wrong. That has nothing to do with risk, more to do with knowledge.